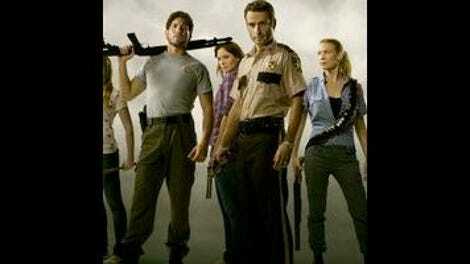 There are a few intense sequences in tonight’s episode of The Walking Dead. Nothing quite hits the blend of great dialogue and uncertainty as the climactic scene of “Nebraska,” but I’m not expecting miracles; I’ll be happy if the show manages to routinely achieve the tension we got out of watching Glenn, Rick, and Hershel try to escape Tony and Dave’s friends. This is the sort of thing we should be seeing every episode, more or less, and it’s a promising sign that the show has managed to keep the screws tight for two weeks running now. There’s still potential here, and the smartest way to get to that potential is making sure Rick’s crew faces a more immediate danger than some sort of vague, metaphysical, “What does all of this mean?” crap. It’s hard to care about a lot of these characters, but if you put them in a tight spot, caring becomes a lot less relevant. The lizard-brain part of our audience subconscious kicks in, and we start not minding so much all the stupid things these people do, so long as we get to see what happens next. This only goes so far, though, and it’s not as easy a fix as it sounds. Creating immediate conflict is simple enough at the beginning—bringing in a group of outsiders who want what Hershel and Rick have is probably the most obvious idea there is, and I’m surprised it’s taken this long to come up—but conflicts that are designed to distract from a gaping hole at a show’s center need to escalate. The danger has to increase, the shocks need to build, more characters need to suffer horrible injuries, and after a while, even that fails to satisfy. You get numb to it eventually, and when that happens, you turn back to the core, to the ensemble itself, because caring about characters never really needs to change. You can make someone more likeable or interesting or despicable, but if you’ve got the basic dynamics in play, you don’t need to do this in big, splashy ways for it to be powerful. Character should generate plot, not the other way around, and if you’ve got a show where all you’ve got is plot, it can’t sustain itself forever. Hell, the show barely has a full season worth of episodes under its belt, and it’s been struggling with this since day two. It’s not a revolutionary thought, but I realized while watching “Triggerfinger” that I still don’t really know most of the people on The Walking Dead. That’s why so many conversations seem aimless, or arbitrary, or disconnected from previous events, and that’s why so much of the action is driven by stupidity. Okay, we have Rick—he’s the good guy, who wants to do the right thing, but is troubled by a world in which the “right thing” has shifted so far away from what he knows that he often feels lost. Beyond that, I have nothing, but that’s okay, because I can give the hero a pass for now. 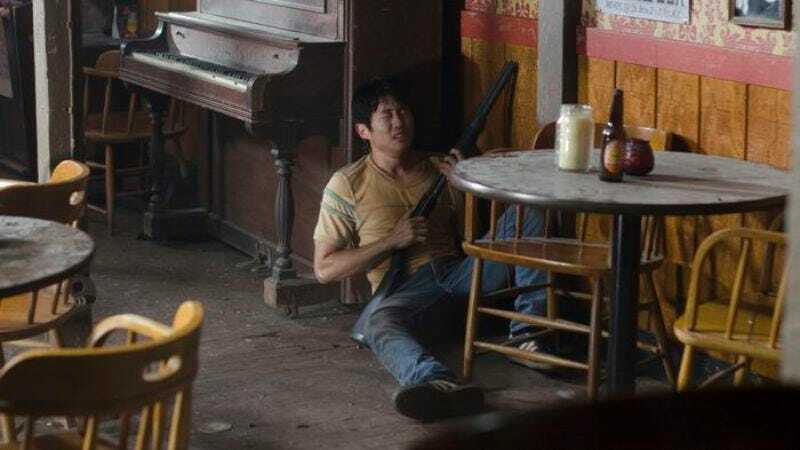 Then we have Glenn, and at this point, I’d say Glenn is the most clearly defined, consistent character on the series, partly because Steven Yeun is good at his job, and partly because Glenn is an audience-identification figure, which means his template has been long established by genre pictures and shows. He’s the Everyman, kind of a nerd—we like him because he, like Rick, tries to do the right thing, but isn’t always up to his own standards. He’s resourceful, and more than a little naïve. These are all good things. Right behind Glenn on the character-definition chart is Shane, who has a lot of potential as the “crazy, on the edge guy,” although he seems to shift between levels of crazy depending on what the narrative needs him to do. Hershel isn’t bad, although that’s mostly because Scott Wilson is the only old man in the cast, so that’s basically what he gets to play. And that’s sort of it. I mean, Dale was doing well for a while, but now he’s on this quest to get Shane kicked out of the group, and that’s all he has anymore. Lori is whatever negative, unhappy conversation the writers want to inject into the world this week. Daryl? He also has potential, although his shift to crazy seemed less character-driven and more an attempt to ratchet up tension in the group. Andrea is hell-bent on being strong, and that’s all she’s got, and Carol, with her daughter dead, only exists because Daryl has to talk to someone. Maggie loves Glenn, and is troubled with her father, and she’s hot. T-Dog is black. This is not good. I’ve mentioned Lost once or twice before in these reviews—remember how clearly defined everyone on Lost was by, oh, four episodes into the show? Remember how one of the best early episodes, the one that pretty much convinced anyone who wasn’t entirely on board after the pilot that yeah, there was something special going on here, was entirely character-driven? (Other stuff happened in “Walkabout,” but odds are, all you remember is Locke in his wheelchair shouting, “Don’t tell me what I can’t do!”) No one’s asking The Walking Dead to be any show but it’s own, but character is important, and once you wipe away the manufactured conflicts, there’s nothing here. Lori deciding to talk Rick into killing Shane because she’s scared of him? That’s cool, that has teeth in it, and the last scene between the two of them in the tent is chilling and kind of exciting, even if it once again has Lori coming off as the worst person in the world even thought she’s basically right. And yet, a scene like that needs us to have a sense of Lori and Rick’s relationship. We should know that the two of them are struggling, but that he’ll do anything to protect her and Carl, and we should know that Lori is having to choose, and that maybe on a conscious level, maybe not, she’s exploiting Rick’s need to prove himself to her in order to get rid of a potentially tricky problem before it gets any worse. All that stuff is present, but it’s not present enough. For a series in which characters are constantly saying what they feel, I have no idea who any of these people are, really, and that’s a problem. It’s not like we started with broad archetypes and are waiting for subsequent episodes to fill those archetypes in. This is more like we started with names and an actor, and keep hoping for the best. Find some way to make these people matter, and we’d have something. Right now, I’m enjoying the intense sequences partly because they’re fun, and partly because I know when they’re over, folks will start talking to each other again, and that’s just the worst. Again, “Triggerfinger” is pretty good, relatively speaking. The standoff in the town demonstrated that Dave and Tony were part of a larger group, and that raises all sorts of terrific possibilities. While Rick’s attempts to reason with the group of guys whose friends he’d just shot wasn’t the brightest choice, it at least felt somewhat justified, given how desperate the situation was, and Rick’s basic character. (By the time Rick shouted, it was already inevitable that there’d be some sort of confrontation; trying to bluff through it does make a certain amount of sense.) The dilemma with poor Randall getting his leg stuck on a fence spike was well-handled, as once again, Rick was willing to do what nobody else was. And while Lori’s car crash is still very silly, her fight against the zombies post-crash was great. One of this show’s few saving graces is that it never disappoints when it comes to the zombie fights, and the bit with the walker tearing off his face while shoving it through a hole in Lori’s windshield was cringe-inducing and clever. And funny, in a dark way. With the slow escalation of the Shane problem, and with Randall’s presence on the farm, The Walking Dead has a decent chance of staying interesting for the next few weeks. It has, in effect, bought itself some breathing room, because those two storylines should most likely hold our interest through all the awkward and tedious conversations that will fill the space between them. (I hope everyone’s looking forward to Glenn and Maggie drama!) Hopefully the writers have chosen to use that room to start making all these nattering voices that annoy us in between cool horror-movie fights into people we care about. Right now, there’s one, maybe two people on this show who I actively hope won’t get killed. Those aren’t good numbers. I feel bad about that T-Dog joke, but seriously, who is he? I'm surprised he hasn't been killed off, just to save the writers the trouble of remembering he exists.